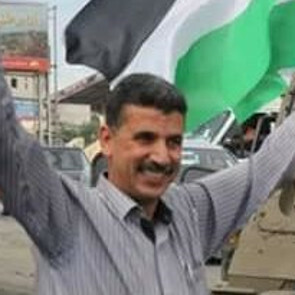 On 26 October, Israeli forces raided the home of human rights defender Mr Salah Khawaja and arbitrarily detained him. Salah Khawaja is currently being held outside of occupied Palestinian territory - in Petah Tikva interrogation centre - without access to legal counsel. Salah Khawaja is a leading member of the Stop the Wall coordination committee and is also a member of the secretariat of the Palestinian Boycott, Divestment and Sanctions National Committee (BNC). Stop the Wall is a grass-roots movement that unites the peaceful struggle of the popular committees in Palestine, advocating nationally and internationally for the human rights of the Palestinian people impacted by the Wall and Israeli settlements. The BNC is a coalition of Palestinian organisations that leads and supports the Boycott, Divestment and Sanctions movement. On 26 October 2016, at around 2.00 am, Israeli forces entered into the neighbourhood where Salah Khawaja resides in Ramallah, West Bank. According to eye witnesses, Israeli forces fired tear gas around the human rights defender’s home, causing physical harm to neighbouring families, including children. During the raid into Salah Khawaja’s home, Israeli forces conducted a search without presenting a warrant and caused some damage to their property. Following the search, Salah Khawaja was detained without being informed of the reason for the raid or his detention. Several hours following the detention, an Israeli military judge granted a 15-day-extension of the interrogation period to the Israeli prosecution without the presence or involvement of Salah Khawaja’s legal counsel. The human rights defender’s legal counsel requested that the interrogation period in detention be reduced to 6 days but the court refused and set a new hearing for 9 November 2016. Salah Khawaja’s colleagues at Stop the Wall have expressed concern that the human rights defender may be subjected to ill-treatment. The human rights defender is being detained in the Petah Tikva interrogation centre – outside of occupied Palestinian territory, in violation of Article 49 of the Fourth Geneva Convention relative to the Protection of Civilians during Times of War, which prohibits the transfer of protected civilians to the territory of the occupying power. I strongly condemn the raid, and arbitrary detention of human rights defender, Salah Khawaja as I believe it to be associated with his legitimate and peaceful human rights activities in the Occupied Palestinian Territory. I am particularly concerned that the human rights defender has not been allowed to meet or communicate with his legal counsel since his detention on 26 October. 4. Guarantee in all circumstances that all human rights defenders in the Occupied Palestinian Territories are able to carry out their legitimate human rights activities without fear of reprisals and free of all restrictions.